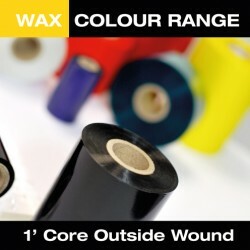 A whole range of colours has been developed on the basis of our current wax/resin and pure resin qualities, to suit a number of automatic identification and graphic applications, with similar printing performance than their equivalent black ribbons. Available in several widths, various grades - Wax, Wax Resin and Resin Grades on 1" Cores, in 300M lengths, with options of Inside or Outside Wound depending on the printer. 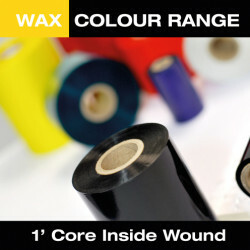 Coloured Wax - Mostly used for printing on Paper / Tag Stock – Uncoated or Coated.